Bluegrass and tamburitza music are two dazzling, virtuosic string ensemble traditions with deep roots in American communities. Though these two distinctive styles emerged out of very different cultural communities—one is rooted in urban/industrial immigrant culture, while the other was born in the uplands of the American South—they have much in common, so much so, in fact, that tamburitza has been hailed as the bluegrass of the Balkans. Pickers’ Paradise features two groups, Tamburaški Sastav Ponoc from Pittsburgh and Danny Knicely’s Next Generation from the Shenandoah Valley, with some of the finest young musicians carrying these traditions into the 21st century. The cross-cultural musical sparks will fly and the jams will sizzle when these artists meet and trade licks on stage. 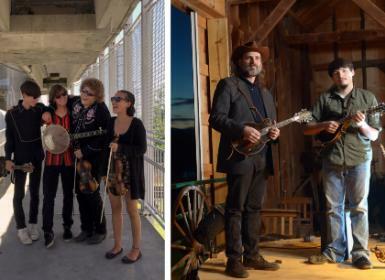 This engagement of Pickers Paradise: From Balkans to Bluegrass is made possible through the Folk and Traditional Arts Touring Network program of Mid Atlantic Arts Foundation in collaboration with the National Council for the Traditional Arts with support from the National Endowment for the Arts.